When it comes to making intricate or complex cuts in metal, wood, or ceramic, there are few tools more important than the jigsaw. There are corded jigsaws available, but the convenience of a battery-powered version is much preferable. Not only is there no cord to get in the way and pose a safety hazard, but it’s highly portable, meaning it can be used on location and doesn’t have to be contained to a single place. With the above in mind, it’s time to take a look at the best cordless jigsaws, and which are going to work best for your needs. With lever-action to help control your speed settings, a sizeable 20-volt Lithium-Ion battery, orbital dust blower and a shoe bevel with four different indents for angled cutting, this DEWALT jigsaw kit is one of the most expensive options we’re looking at, but also one of the most feature packed. Variable speed settings up to 3000 spm (or strokes per minute) and the four-option shoe bevel allow you a lot of control over the cut, making it easier to start off intricate and increase the power as you work a cleaner cut. Safety features are good, too, from the dust blower to the sheer ease of changing the blades when you need to. It feels just as powerful as any corded jigsaw and the battery, though sizeable, isn’t too heavy, making the most of its portability which is always good. While cutting through just about all woods and ceramics with ease, it does have a noticeably tougher time with harder metals. It’s not enough to make it unsuitable for the job, but extra safety is needed as it can require a bit more effort from the user. Some users have noted occasions where the blade has come loose while operating, but this may simply be a case of not affixing it thoroughly to the tool in the first place. So long as you’re careful, this is a highly effective, efficient tool, ready to compete with any corded variety. 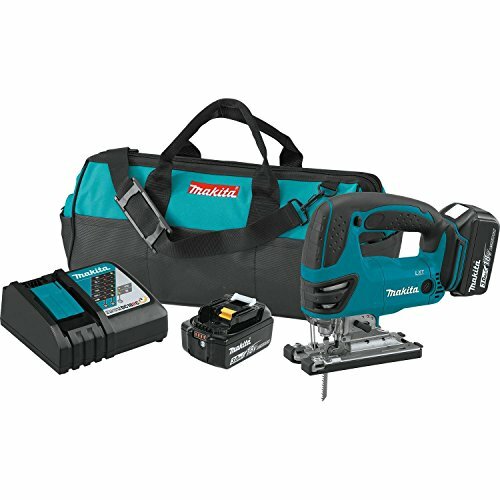 The most expensive of the cordless jigsaws we are looking at today, the Makita has a slightly smaller battery than the DEWALT, meaning it holds less of a charge. What’s more, it delivers up to 2,600 SPM, a slightly lower cutting speed. That said, it has some standout features of its own, including a tool-less blade change system that makes switching blades even easier than DEWALT, and 2-finger speed controls that allow you to easily manage your cut in the middle of the job. Sturdy and well built, the Makita feels like a professional tool as soon as you get your hands on it. The LED light is a great feature, too, helping you maintain visibility for both safety and more precise cutting. Both the wood-cutting and metal-cutting blades do their job very well, with none of the issues that the DEWALT can suffer when cutting harder metals. One of the issues is that the Makita is noticeably heavier than corded variants due to the size of the battery, which plays a role both in safety and operator fatigue. The smaller batteries are something of an issue, but if you’re willing to pay for a second battery, you can keep one charging on the go while the other is in use. A fast charging speed means you’re never too far from getting back into action, regardless. With good visibility, ergonomic design, and easy speed controls, it’s highly effective, so long as you have the extra battery to keep you in action. In the mid-priced range, we have the Hitachi. 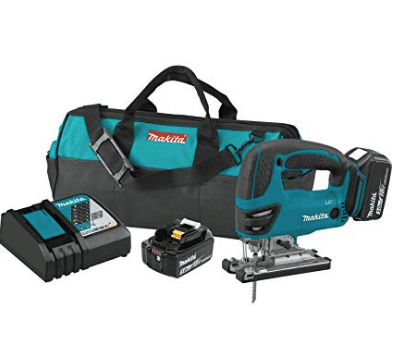 Like the Makita, it has an 18-volt battery, meaning it doesn’t offer quite as long a battery life as 20V alternatives. Three-mode orbital action and a tool-less blade changing system allow for the efficient switching between different jobs, whether you’re working with wood, ceramics, or metals. An ergonomic D-shaped handle with a soft grip makes it particularly comfortable, suitable for long periods of use, too. 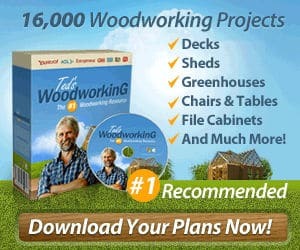 This is a perfect tool for an amateur user or hobbyist carpenter. Very lightweight and highly ergonomic, it fits the hand well and keeps the operator comfortable during even the longer jobs. Besides all the features mentioned above, the lifetime guarantee covers not only repairs but the prompt delivery of replacement parts, which is a nice touch. Overall, a great option for your money. One significant issue is that it doesn’t come with a battery included, so bear that in mind. That said, it is compatible with all Hitachi 18V Lithium-Ion batteries so finding the power you need is easy enough. While it’s highly comfortable and efficient for softer woods, it does have a noticeably tougher time with not just harder metals but harder woods, as well. It’s not a professional grade tool, but that should be expected given the less expensive nature of the tool. 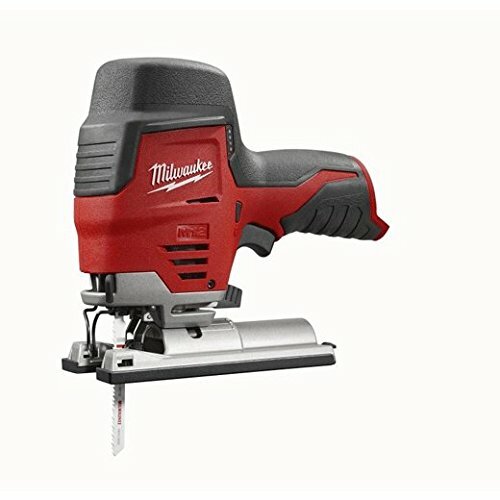 The cheapest amongst the options we’re looking at, the Milwaukee cordless jigsaw comes compatible with a significantly smaller battery, at 12 volts. Much smaller than the other products reviewed here, it’s also much more portable and slightly easier to use. Its extremely lightweight nature means it’s great for precise cuts away from a workstation and it still cuts very effectively through softer woods, even if it can’t be used with as wide a range of materials as the other tools reviewed here. Again, you have to buy your own batteries for this one. Given that 12V batteries aren’t as common as the 18V or 20V, this makes it a little less convenient, but it’s also cheaper in the long run. The plastic frame doesn’t feel quite as stable as the all-metal options like the DEWALT, either. The safety conscious should be aware of the fact there is no front-guard for the handle, meaning that while it is easy to use, it should be handled with the utmost of care. 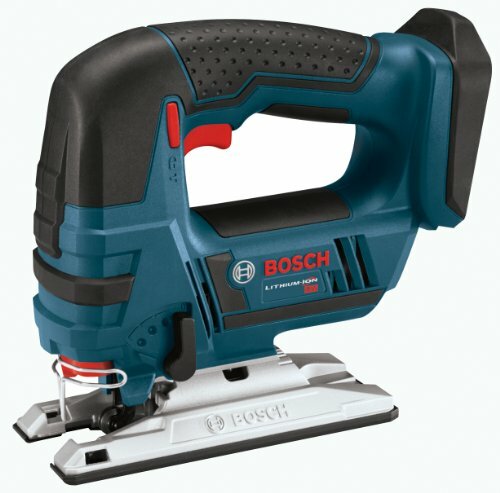 Around the same price as the Hitachi and also coming with the same size of Battery, the Bosch is a strong contender for those amateur carpenters and DIY users who need a cheaper, but still efficient tool. Features specific to this one includes an adjustable footplate for bevel cuts, a dust blower to complement the LED light and safety features that protect against both overload and overheating. For its price, its undeniably feature-packed. The safety features of overload/overheat protection and dust blowers are particularly noteworthy. It also has a soft grip, though not quite as ergonomically designed. For its price, it’s highly effective, cutting through most woods with ease, and no blade wandering. The brake feature conveniently allows you to stop at a moment’s notice, too, so control is on-point. Like the Hitachi, it’s worth noting that the battery and charger are both sold separately, so expect a little extra investment. What’s more, it eats through batteries significantly quicker, so keeping a spare charging to switch to is recommended. While the base is adjustable, it does require you to make use of the included Allen wrench, which is a little more convenient than the other entries with this feature, too. If you don’t mind that, it’s an effective, feature-complete jigsaw perfect for DIY users. 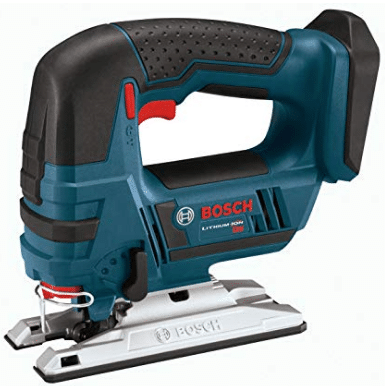 COMPACT: The Bosch JSH180B 18V jig saw is lightweight and compact. 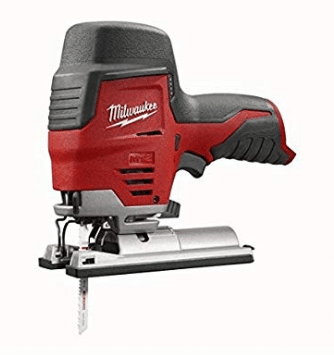 It is up to 30-percent lighter and up to 10 percent smaller than the leading competitor jig saw. Its lightweight design and small grip diameter reduces user fatigue for extended periods. CONVENIENT: The jig saw's t-shank blade change system allows for tool-less blade changes, eliminating the need for users to touch the hot blade. The adjustable footplate allows for bevel cuts up to 45 degrees. VISIBILITY: With an always-on dust blower and an LED light, the JSH180B jig saw offers increased visibility along the cut line. PROTECTION: With Electronic Motor Protection and Electronic Cell Protection, both the battery and the motor are protected against overload and overheating. STORAGE: The JSH180B comes complete with an on-board bevel wrench storage for easy portability and convenience. If you want the best of the best, then it’s hard to argue against the Makita. Featured packed and able to handle all kinds of materials, it’s hard to notice the differences between it and a corded jigsaw. 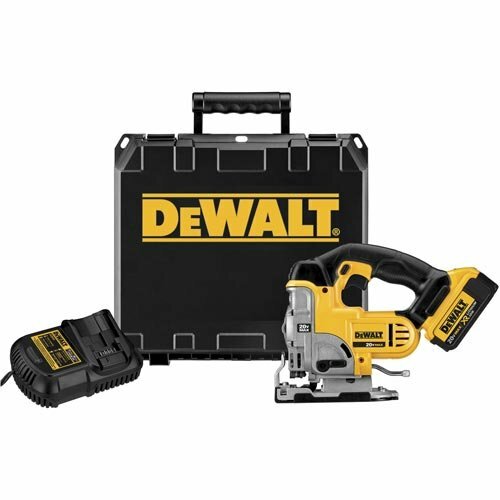 With slightly more battery life but slightly less power when cutting metal, the DEWALT is easy to recommend, too. For those looking to spend slightly less, the Bosch has more safety features, but the Hitachi overall feels like a higher quality machine and doesn’t eat batteries quite as quickly. Just make sure you’re going into the higher-price ranges if you want a portable jigsaw cutter suitable for professional use. 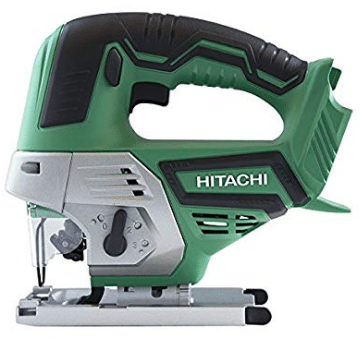 Power supply: The higher the voltage, the more cutting power at your disposal, with most cordless jigsaws coming with 18-to-20 volt Lithium-Ion batteries. The size of the battery, as well as the type, dictate how long you can use the jigsaw before needing to recharge. Speed settings: While some jigsaws come with a single speed, others have multiple speed settings which allow you to start the cut with precision and speed up as the process continues. 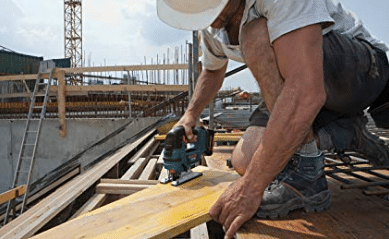 Portability: The weight of the cordless jigsaw can determine how portable it is and how safe or suitable it is to use for long periods at a time. Extra perks: Base plates and beveled shoes can allow you to make bevel cuts at different angles. Dust blowers can help maintain visibility without having to stop to clean up. Bright LED illuminations can help make the project easier to see, too. There is a range of different features worth considering, all of which we will look at in our reviews.